At The United Methodist Children’s Home, we envision a world where every child is raised in a loving, compassionate, and nurturing home. With your generous support in 2015, we came so much closer to achieving that goal. Whether you are a volunteer, donor, foster parent, or simply helped spread the word of our work, we are grateful! Join us in 2016 and together, we can help even more children and families in need. Foster – Your family can provide that loving home that thousands of kids long for. Take advantage of the joy that comes from fostering through the Children’s Home. We will support you every step of the way. Volunteer – You have talents and compassion. 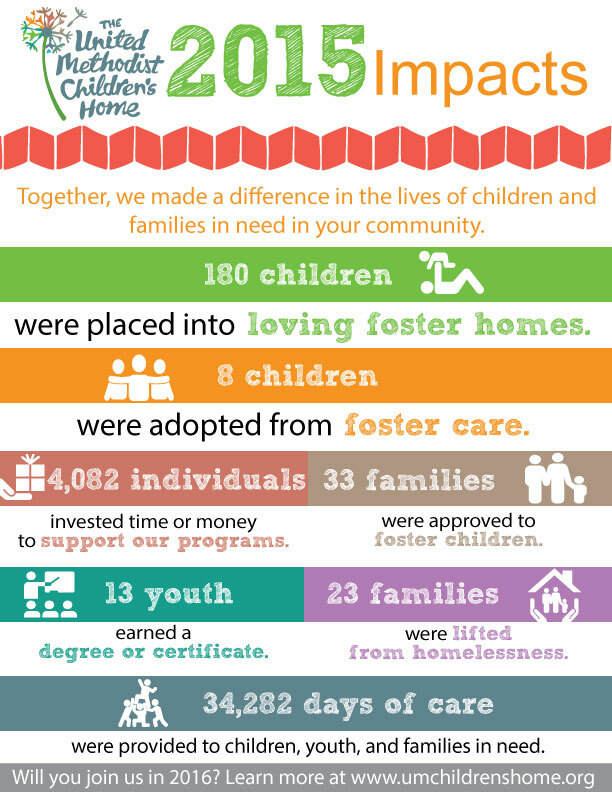 The Children’s Home has meaningful ways for you to make a difference. Give – Consider becoming a monthly sustainer, ensuring the Children’s Home can grow to serve more kids in crisis. Check out creative ways to give including asset-based gifts and in-kind gifts.